Induction, T5 and LED Ice Rink Lighting. 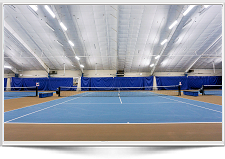 The Brite Court Ice Rink lighting (Brite Ice) fixtures are specifically designed fluorescent fixtures that are thermally engineered for indoor Ice sports facilities. Simply put, Brite Ice in terms of light output, durability, ease of maintenance, lamp protection, and longevity in these harsh environments should be your first choice for lighting. 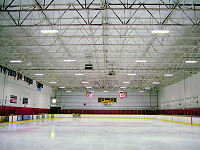 Our ice arena lighting systems deliver substantial energy savings. 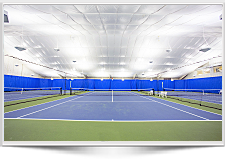 If your facility currently uses 250-watt, 400-watt, 1000-watt metal halides or even T12 fluorescent fixtures, replacing them with our T5 fluorescent fixtures will typically result in a 50% plus energy reduction. In addition to the extraordinary wattage reduction, Brite Ice Rink lighting fixtures introduce far less heat into your facility thus reducing your refrigeration loads. 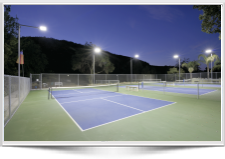 Halide fixtures burn very hot whereas our T-5 fluorescent fixtures operate up to 70% cooler than metal halide fixtures, which can result in an additional 12%-19% energy savings due to BTU reduction. We offer several types of lighting solutions for ice rink lighting, all are performance based and designed for damp location and cold environments. Our most maintenance free fixture would be the induction which is rated at 100,000 hours lamp life, next would be the T5 Ho fluorescent at 60,000 hours and then the LED at 50,000 hours. All three option will deliver high definition performance while dramatically reducing your energy cost and BTU output.